ALPEN 20-60x80 w/45 deg eyepiece Waterproof Spotting Scope Kit | Spot On! 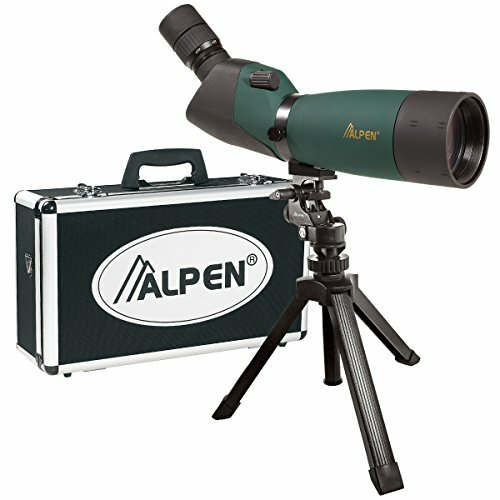 This Alpen 20-60×80 zoom spotting scope KIT includes the full size 80mm waterproof and fogproof spotting scope with 45 degree eye piece. The zoom magnification provides nice field of view at 20x and super close up viewing at 60x. The retractable sun shade helps reduce glare and the BAK4 multi-coated optics deliver a bright crisp image. The 45 degree eye piece design can be adjusted to any viewing position by simply loosening the adjustment collar on the center of the body to fit any situation. Comes with a micro adjustable horizontal – vertical table top tripod and durable attractive aluminum foam filled case. Backed by Alpen’s lifetime warranty against defects in materials and workmanship. The spotting scope was awarded Great Buy as seen in Outdoor Life magazine’s gear test issue.